In today’s food-obsessed culture, Japanese noodles inspire passion and devotion. Ramen is a big deal. An annual event in DC- Ramen World– is singularly dedicated to this once under-appreciated dish. 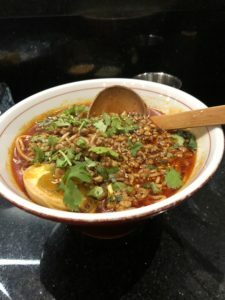 A focus on various types of noodles, broths, and toppings can distinguish one restaurant from another, and trying to decipher all the options can make ordering ramen an overwhelming process. 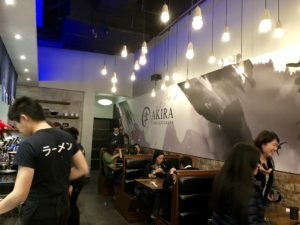 I race to Akira shortly after the review is published, delighted that I can enjoy a great bowl of Japanese ramen so close to home. I’ve returned to the restaurant twice , and my goal is to get back here pronto, or however you say “right away” in Japanese. Choosing ingredients for a bowl of ramen can be complicated. First you must pick a style of broth. There is shio ramen (salt-based), shoyu ramen (soy based), miso ramen (soybean-based), and tonkotsu (pork bone based). Each has nuanced differences in flavor and color. Many of the bowls at Akira are tonkotsu-based, which is notable for its thick off-white broth. Once a broth style is selected, it’s time to consider the toppings. Standards include bean sprouts, onion, scallions, bamboo shoots, nori, and egg. The Akira menu lets you keep it basic, or you can raise the bar with deep fried chicken, shrimp tempura ramen, or Volcano ramen for heat-seekers. I prefer ramen that is spicy but balanced. I don’t mind gulping water in between slurps or even wiping sweat from my brow, but I don’t want to cross a line into numbing heat that masks flavor. Tantanmen ramen is a special at Akira Ramen. It’s spicy, rich, and complex, incorporating sesame paste and ground pork into the mix. If you want a full-bodied ramen that is choreographed to just the right level of intensity, this is the one. Vegetable ramen is made hearty with scallions, bamboo shoots, wood ear, corn, bok choy, mushrooms, bean sprouts, and tofu. The broth is more delicate than the others, but you can order it and not feel slighted in the least. There’s another critical ingredient that distinguishes one ramen spot from another, and it may be the most important factor of all. Noodles can make the difference between a good bowl of ramen, and one that is mind-blowing. And it’s the noodles that take ramen here to another level. A world-class noodle-master -yes that’s a thing- serves as a consultant to Akira. Chef Shuichi Kotani learned to make noodles in Tokyo at the age of 19, and he hasn’t stopped since. He has perfected the art of noodle-making and now serves as a consultant to restaurants and chefs worldwide. Kotani is passing on his craft to Akira head chef Tony Lin and his team. All noodles are made in-house, which is not typical for ramen-serving restaurants in the U.S. Most import their noodles. The ramen noodles at Akira are made from wheat, but Kotani’s true passion is soba noodles. Look for soba to make an appearance on the menu in mid-May. I had an opportunity to observe a noodle-making demonstration by Chef Kotani at Akira, and it was an eye-opening experience. The group is transfixed as the chef works with the delicate buckwheat flour, transforming it before our eyes into perfect gluten-free soba noodles. As he forms the dough, he alternates between closing his eyes and relying on muscle memory, and performing a syncopated dance. All the while he describes his enthusiasm for the flavor, texture, and health benefits of soba. The quality of the ramen is why you should visit Akira, but there’s more. The second part of the restaurant’s name is Izakaya, a term that in Japanese translates to an informal pub. The decor is simple, but there’s enough pizzazz to give it a funky appeal. 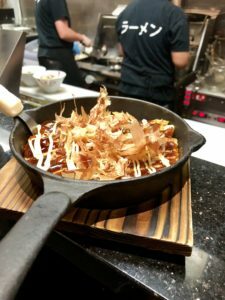 Sit at the counter for a view of the action, including cooks torching pork belly over a flame to enhance the flavor. 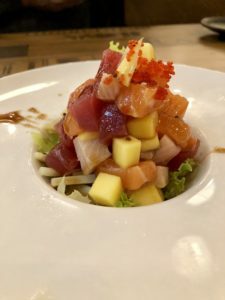 For a perfect precursor to ramen, there are refreshing appetizers like poke salad, sashimi, and pepper tuna. For more pop, try the Japanese pancake with eggs, shrimp, and cabbage, perched over strips of bacon. The pancake is topped with a dancing layer of bonito flakes, making for a dish that is pure fun. 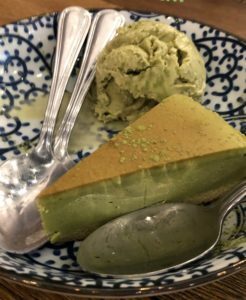 Color me skeptical when it comes to the one dessert on the menu- green tea ice cream with green tea cheese cake. I change my tune once I try it. The green tea flavor comes through without being overwhelming, and both components strike a balance between sweet and a touch savory. 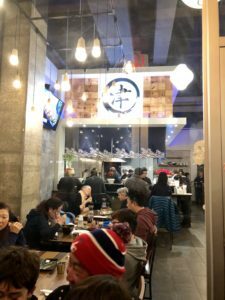 Akira Ramen and Izakaya founder Edward Yo is turning the block into a destination for Asian food with the recently opened Hot Pot & Grill, and Gong Cha, a Taiwanese bubble tea chain. Wong is also the developer for The Spot, an Asian food hall, heading to Rockville Town Square this summer. The vision of Chef Shuichi Kotani artfully constructing noodles is still dancing in my head. 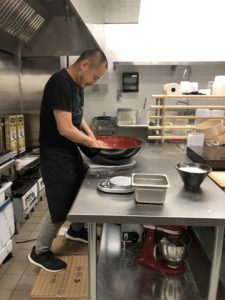 We’re fortunate to have him working with Akira Ramen and Izakaya, where they’re rocking the ramen in Rockville.